ProNeema is a skin cream developed by a Pharmacist specifically to treat diabetic patients with extremely dry skin, but can help anyone afflicted with dry skin. He created a patented formula specifically for diabetics, because he noticed how many of his patients needed relief and healing from their dry skin. One of the most important ingredients of ProNeema is oil from the Neem Tree. The Neem Tree is a tropical evergreen native to East India, but can be grown in tropical areas. Over 5,000 years ago, our ancestors knew that the oil from the Neem Tree provided special medicinal powers to cure a wide variety of ailments, including leprosy, gastro-intestinal problems, malaria, ringworms, diabetes, colic, anorexia, boils, epilepsy and ulcers. Although we know today that neem oil extract does not cure all of these diseases, research is underway to study how neem boosts our immune system activity and why it kills or slows the growth of bacteria. 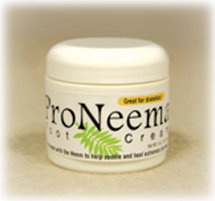 ProNeema is a non-greasy foot cream designed to heal and protect dry skin. It is especially formulated for the needs of the diabetic foot. ProNeema contains Neem Oil, which includes anti-bacterial and anti-inflammatory properties. ProNeema also contains Arginine, an essential amino acid, which helps increase blood flow to your feet and toes. The increase in blood flow will help skin to heal, warm your feet, and can even improve nerve function. ProNeema also contains ingredients such as Allantoin, Vitamins A and E, which help skin to heal and regenerate. Peppermint Oil is added to help soothe and relax your feet. ProNeema contains all of these ingredients to effectively heal dry skin, and improve wound healing. ProNeema stimulates new, healthy skin, and if used daily, will help prevent many foot problems associated with diabetes.